Why pay more that $49.00 forhttp://www.ezcell.biz your mobile service? Unlimited voice, text, and data for only $49/month - OR LESS! And you get paid good $$ for referring others. The Solavei mobile service is actually a mobile virtual network operator (MVNO), which means it does not have its own own cellular network, but is built on the backbone of T-Mobile 4G network. Solavei's plan includes unlimited voice (including roaming), unlimited text and picture messaging, unlimited data, and no overage fees, credit checks, or contracts, all at just $49 per month, plus tax. In addition, you can keep your existing phone number when switching to the Solavei network. And when you share with family and friends, your service can be completely free. Compensation Plan members have the opportunity to earn real money simply by sharing the Solavei service with friends and family. Each time you enroll three new members (known as a Trio), you will receive a $20/month credit, as long as their accounts remain current. You can also earn an extra $10/month for every three people that sign up under one of your enrollee’s accounts, creating very high earnings potential. 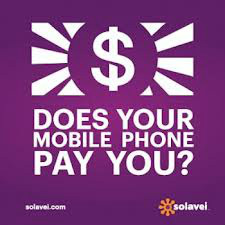 In addition, you can earn up to $20K per month through Solavei’s Path Pay, which is a monthly bonus based on the total number of Trios in your network. As you can see, your earnings potential is almost unlimited.